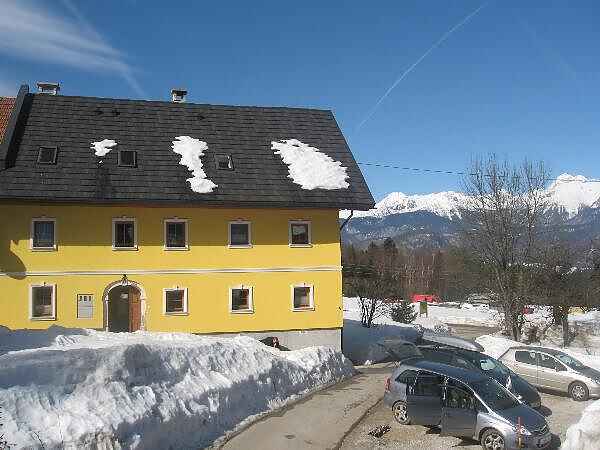 The Tubej tourist house**** is the only one in Bohinj located directly above the ski slope Kobla in the centre of the Bohinj basin. Completely renovated in 2007, the house provides high-quality comfort in 4 apartments 4 stars with kitchen, living room, badroom, bathroom - 2x2/4 person, 1x4/6 person, 1x6/8 person - total available for 22 persons and maintains a homelike traditional environment with a lot of natural wood, a fireplace, steam sauna, massage shower and all new equipment the tourist may desire. Half board is served in the Ravne restaurant on the Kobla ski slope, only 100 m away or on sun houses near apartment TUBEJ. We offer a storage place for skis, and a rental service of bicycles, ski equipment, sleighs, and we also organize various active sports, hiking, fishing, cycling and skiing programs (ski school) in Bohinj and all across Slovenia. The house is surrounded with several acres of meadows and pine and deciduous forests offering spectacular hikes through nature. Our terrace with tables, deckchairs and a picnic area will serve as a pleasant spot to relax after an exciting day in Bohinj. Lake Bled and Lake Bohinj are only a few minutes away and you can visit them by bike. When there is still fog in the basin, 500 m above sea level, the Tubej house, 730 m above sea level, is already bathing in the sun. The pleasant hosts will be happy to welcome you and offer advice on how to best enjoy the beauty of Bohinj and Slovenia as a whole.